The reviews were not exactly effusive. The above comments, which are a little more than four years old, offer a lukewarm appraisal of what was then known merely as the Rattlesnake Bar and Grill. 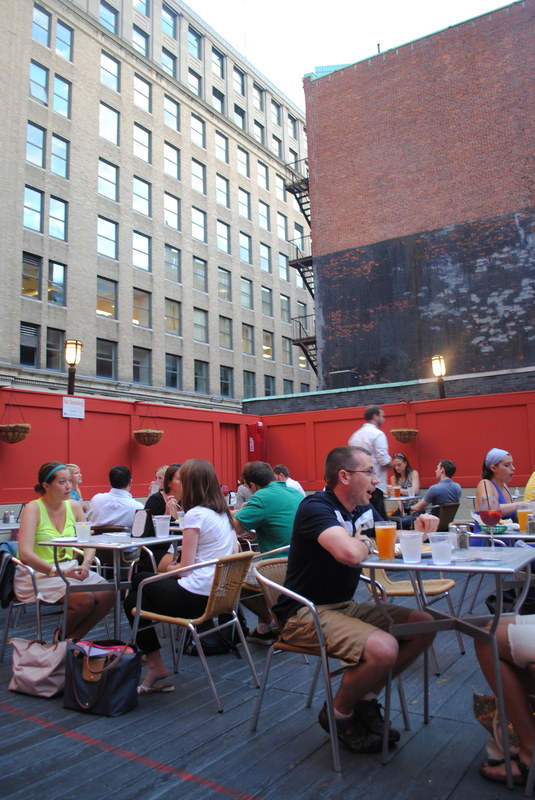 Opinions of this Boylston Street bar may have varied, but at the time, most people agreed on a few things: it was a fairly unremarkable establishment, greatly enhanced by its having a roof deck; the margaritas were good; and the food certainly was not. But apparently that was enough. I don’t know how many slicker, trendier bars have opened and subsequently closed their doors since the Rattlesnake slithered into town in 1990, but 23 years in business represents some impressive longevity. Not bad for such a “blah” bar. Maybe the salient point here is that a roof deck and a liquor license will get you far in this town, especially with an address in one of Boston’s most heavily trafficked areas. The Rattlesnake probably could have maintained the status quo indefinitely – with a rooftop bar, potent margaritas, and a decent beer list, who cares whether the food is any good? That’s what makes January 2009 such a fascinating point in the Rattlesnake’s history. 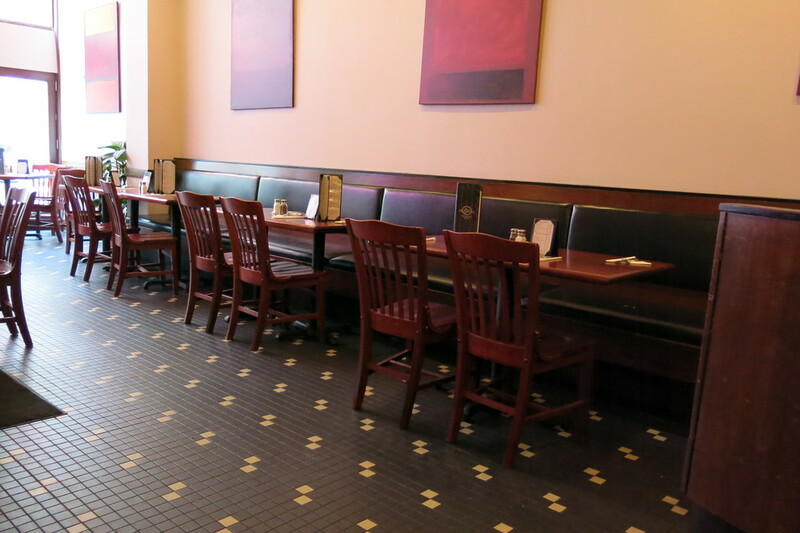 It was then that this fairly unremarkable bar made a fairly remarkable move – hiring a renowned chef. As the story goes, the Rattlesnake’s owner ran into Brian Poe, then the Executive Chef and Director of Food and Beverage at Millennium Boston Hotel, and asked for his help in recruiting someone to give the maligned food menu an overhaul. Fresh off a culinary vision quest across South America in 2008, Poe picked the best man for the job – himself. He kept the Rattlesnake’s Southwestern cuisine theme intact, but infused it with Latin American flair, amid a host of other creative twists. Adios, grocery store quesadillas and nachos made with Cheez Whiz; hola, duck tacos and grilled cornbread. The kitchen was rebranded as Poe’s Kitchen at the Rattlesnake, and the bar itself became something that its naysayers and even its most loyal customers wouldn’t have expected – a genuine destination for food. Although the menu got an upgrade, the rest of the Rattlesnake maintains much of its pre-Poe identity. With its aging façade and plain interior, it’s not as fashionable as some of its Back Bay neighbors, nor ironic enough to attract hipsters. The downstairs area oozes early-90s charm, with a green and white tile floor and a blue-tiled wall, strung with lights, behind the bar. There’s a long bar with about 12 seats, along with plenty of tables and booths. Large chalkboards herald the dinner and beer specials. The layout and décor might be very simple, but it’s a good-size space that can accommodate a crowd. Now while the Rattlesnake may be famous for its margaritas, its beer list is pretty solid too. (I’ve been here a few times over the past several months, so bear with me if the beer list or food menu has changed.) 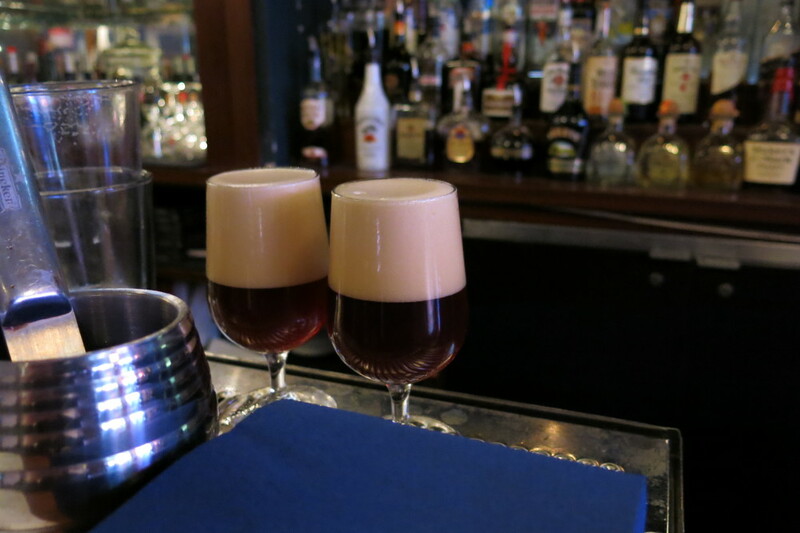 The 16 beers on draft include the usual suspects, like Guinness, Sam Adams, and Harpoon, along with some rotating drafts like Lagunitas and Left Hand Brewing Company. On one of my visits a few months back, I was intrigued by the three taps devoted to Stone Brewing Company, each of which was marked with a date – 08/08/08, 09/09/09, and 11/11/11. It was part of Stone’s Vertical Epic Ale series, a project that began in 2001, in which the company released a different Belgian-style beer every year – one year and one month from the previous release. The first beer was released on 02/02/02, the last on 12/12/12. As I have an entirely unwarranted belief that 11 is a lucky number for me, I went with the 11/11/11. Intense and malty, with a 9.5% ABV, this bad boy had me reeling. Food was most definitely in order. I wish I’d spent more time at the Rattlesnake back in the day so I could fully appreciate the transformation of the menu. Regardless, one look at the fusion of Latin American, Mexican, and Southwestern flavors will tell you the food is anything but ordinary. Appetizers like calamari are livened up with a dusting of chili powder, guaymas sauce, corn puree, and cilantro puree. Then there’s the taco menu, where you can get spicy cubano tacos (spicy being an understatement, take my word for it), or antelope tacos, made with duck fat infused ground antelope, topped with jalapeno bacon ranch. Antelope may not be your typical taco filler, but if you’re familiar with Brian Poe’s post-Rattlesnake project, the Tip Tap Room, you know the man a fondness for unconventional meats. So I was pleasantly unsurprised to see that one of the Rattlesnake’s signature entrées is the wild boar burrito – chili-braised boar, Oaxaca cheese, IPA-infused refried beans, green chili puree, verde rice, boar bacon, and plantain salsa. The result was phenomenal. And I especially appreciate that it isn’t merely a novelty item – simply using boar meat in an entrée would be enough for people to try it, out of sheer curiosity. But this went much further; the other ingredients were thoughtfully chosen, and they combined to create a unique burrito that burst with flavor. The boar bacon contributed a crispy texture, and even the flour tortilla was baked, giving the exterior a nice crunch. I returned a month or so later, because I would be remiss if I wrote about the Rattlesnake without trying their margaritas. 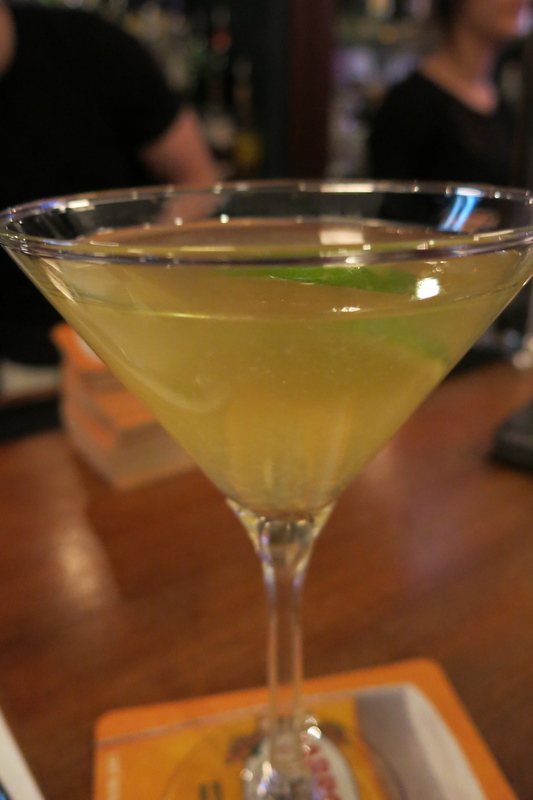 With a house-made mix and a plethora of tequilas to choose from, this is the drink that Rattlesnake made its name on. It’s also the only bar I know of that reportedly makes you sign a waiver if you’re daring enough to try their Ghost Chili Challenge margarita – its central ingredient being a tequila infused with the infamous ghost chili, one of the hottest peppers on the planet. As your faithful bar correspondent, I realize I should have gotten this and reported back on it. But I’ve never much loved spicy drinks, and I wasn’t paying $16 just so I could drink half of it and then spend the rest of the night praying for death. So I kept it simple and started with the house margarita. It was pretty standard, but satisfying. It strikes me as a recipe that hasn’t changed at all – and probably doesn’t have to. 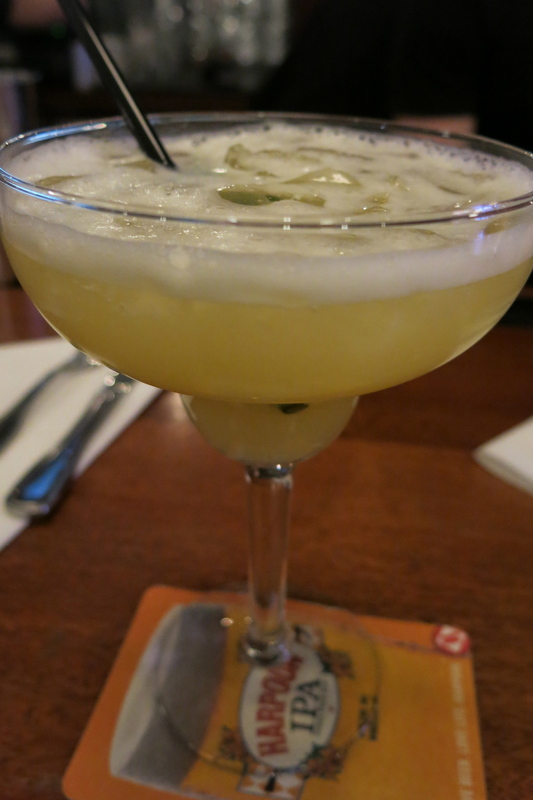 Next up was the Bostonian Margarita, made with Espolon Silver, Citronage, agave nectar, and fresh lime juice, topped with a prosecco float. This one had a slightly spicy kick, balanced nicely by the sweetness of the agave. The prosecco added complexity and gave it more texture than your average margarita. They were exactly what the name said they were – as in, roasted chicken skin, breaded and deep fried. You know what? Hats off to whoever came up with this, whether it was Brian Poe himself or someone in his employ. Clever and absolutely delicious. It may not have been the healthiest thing I’ve consumed all year, but it was totally among the most delicious. If you’d put another plate of them in front of me when I was done, I’d have devoured them all over again, right before my heart stopped. This particular visit to the Rattlesnake took place week or so after the Boston Marathon bombing. Thus, it was with mixed feelings that I closed out with a limited edition “26.2,” brewed by Sam Adams in advance of the marathon. This “gose” beer was refreshing and citrusy, and probably the sort of thing you’d appreciate after running a marathon. 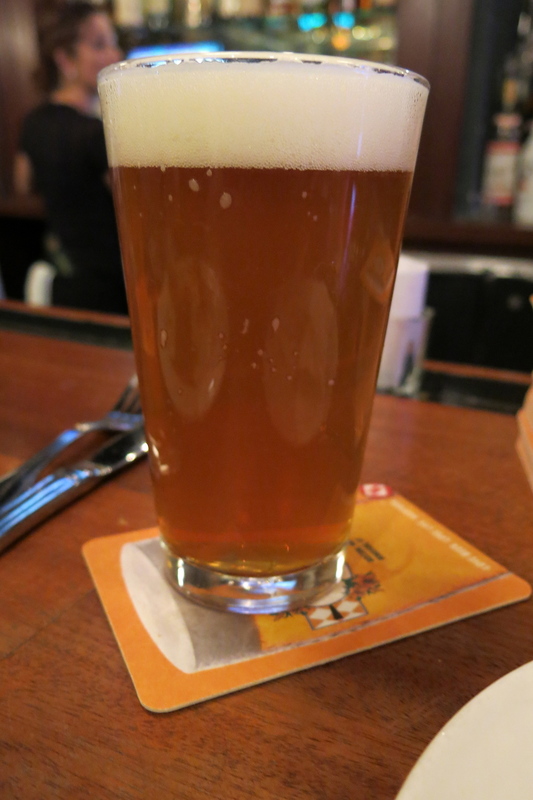 But there was a certain wistfulness in drinking a beer that was made in anticipation of Boston’s signature event, with all the expectancy of it being a glorious day, only to have it end in tragedy. On that note, though, I recently read a story about some loyal patrons who were evacuated from the Rattlesnake when the bombs went off, but came back when it reopened a few days later to pay their tabs. Just another reminder that the good people in this world far outnumber the bad. I wrote a piece about the Rattlesnake’s roof deck last summer, so I won’t focus too much on it here. Still, it warrants a mention. One of the only rooftop bars in the Back Bay, the Rattlesnake roof deck draws a strong after-work crowd and can fill up quickly on the weekends. In addition to about 15 tables, the roof deck has its own bar, which makes it ideal for an outdoor drink when you’ve been cooped up in the office all day. The beer selection is not nearly as expansive as it is downstairs, but I suppose drinking on a roof deck in the summer calls for something fruity and refreshing, like a glass of sangria or the Thai mojito, made with coconut rum, lemongrass syrup, and muddled lime. The atmosphere on the rooftop is just as casual and laid-back as it is downstairs. It’s been spruced up a bit and gotten a paint job in recent years, but for the most part, it’s the same basic, unadorned roof deck it always was. But that’s one thing about the Rattlesnake that probably never has to change. In a city that endures some pretty rough winters, it’s hard to improve upon the simple act of enjoying a drink in the warm weather. In the wake of such dramatic upheaval in the kitchen, it’s interesting to note what didn’t change at the Rattlesnake. Namely, everything else. 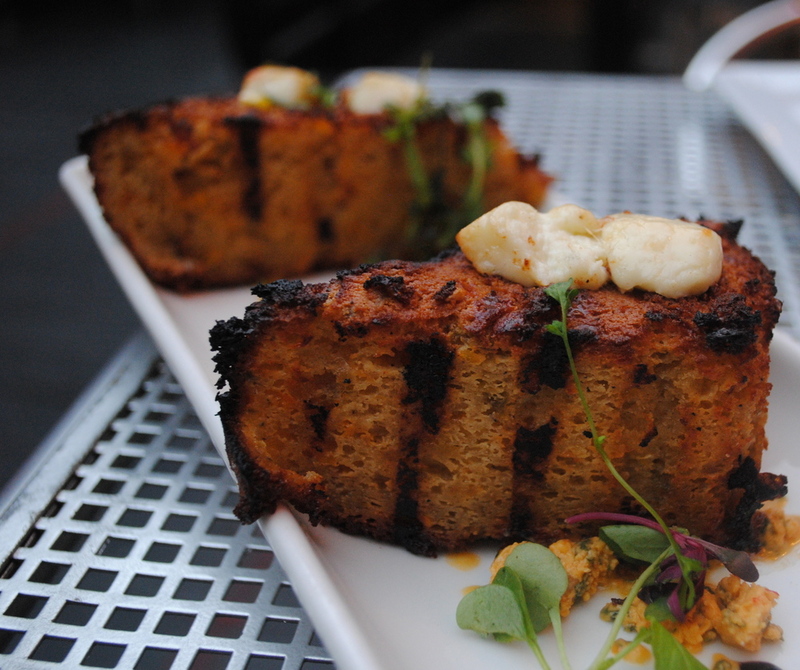 A new chef and a bold, innovative menu could have brought a jarring new attitude, an entirely different look and feel. Instead, the Rattlesnake retains much of the identity that preceded the extreme makeover of its menu. It lacks the snazzy décor of newer cocktail bars, with their modern style or their throwback themes. But the margaritas have survived martinis and mojitos and will probably make it through the craft cocktail phase unscathed. The roof deck will forever be a draw. The enhanced menu may have resulted in some enhanced prices, but they aren’t exorbitant (especially for good food in the Back Bay). My wild boar burrito was $15.75, which makes it the most expensive burrito I’ve ever had – yet also the only one made with boar meat. Beers are about $6.50, and margaritas range from $8 to $12, or $16 if you think you’re up to the Ghost Chili Challenge. 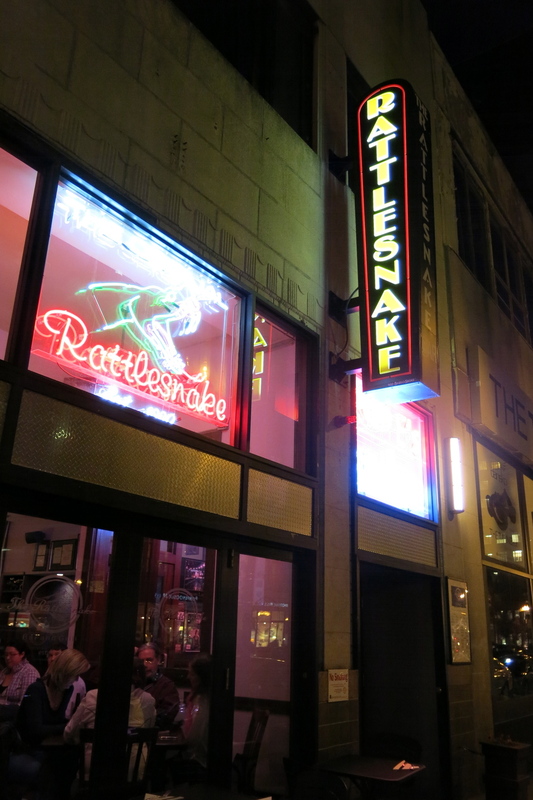 Back in the day, the Rattlesnake Bar and Grill was a fun place to end your night. That hasn’t changed. But with one of the more creative and satisfying menus in the area, Poe’s Kitchen at the Rattlesnake is also a good place to start your evening.